James Stuart was born October 14, 1633, at St. James's Palace in London. He was the third son of King Charles I and of his wife, Princess Henrietta Maria of France. From his birth James bore the title of "Prince of England, Scotland, France and Ireland". At the same time he was designated "Duke of York". Six weeks after his birth James was baptised according to Anglican rites by William Laud, Archbishop of Canterbury. His godparents were his aunt Elizabeth, Electress Palatine of the Rhine ("Winter Queen of Bohemia"); her son, Charles Louis, Elector Palatine of the Rhine; and Frederick Henry, Prince of Orange. In 1638 James was named Lord High Admiral of England. He was named a Knight of the Most Noble Order of the Garter, April 20, 1642, and raised to the Peerage of England with the title of "Duke of York", January 27, 1644. In 1648 James escaped from the Parliamentary forces which would execute his father the following year. James lived the next twelve years in exile in the Low Countries and in France. In 1652 he received a commission in the French Army, and subsequently served in four campaigns under the Vicomte de Turenne. On May 10, 1659, James received the additional English title of "Earl of Ulster". He was created "Duke of Normandy" by King Louis XIV of France, December 31, 1660. Charles, Duke of Cambridge (1660-1661). Mary (1662-1694), married Prince William III of Orange, Stadtholder of the United Provinces of the Netherlands. 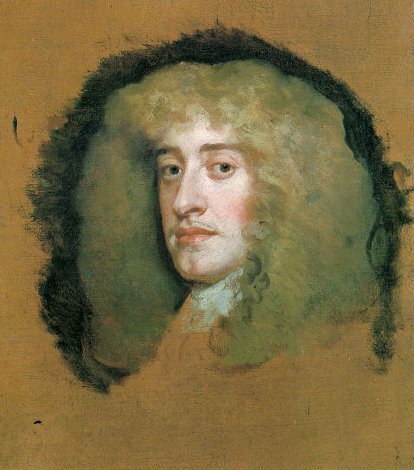 James, Duke of Cambridge (1663-1667). Charles, Duke of Kendal (1666-1667). Edgar, Duke of Cambridge (1667-1667). In 1670 both James and his wife Anne were reconciled to the Catholic Church. No public announcement of this decision was made, but both ceased to attend Anglican religious services. James' wife Anne died at St. James' Palace, London, March 31, 1671. In 1673 the Test Act was passed, requiring the holders of all public offices to receive communion according to the rites of the Church of England, and to take an oath against the Catholic belief in transubstantiation. James thereupon renounced his offices including that of Lord High Admiral of England. His conversion to Catholicism thereupon became public knowledge. a stillborn prince(ss) (born 1674). a stillborn prince(ss) (born 1675). Charles, Duke of Cambridge (1677-1677). a stillborn prince(ss) (born 1681). a stillborn prince(ss) (born 1683). a stillborn prince(ss) (born 1684). James, Prince of Wales, later King James III (1688-1766). Because of James' conversion to the Catholic faith, three attempts were made in Parliament to exclude him from the succession to the throne; none of these was successful. At the death of his brother Charles II, February 6, 1685, James succeeded as king. He was crowned privately according to the rites of the Catholic Church, April 22, 1685, at Whitehall Palace, and publicly according to the rites of the Church of England, April 23, 1685, at Westminster Abbey. Always an advocate of liberty of consicence, James published a Declaration of Toleration for Scotland, February 12, 1687. He issued an even more liberal Declaration of Indulgence for England, April 4, 1687; this he re-issued April 27, 1688 with an order that it be read in all churches. Seven bishops petitioned against this order. On June 30, 1688, five English peers and two commoners sent an invitation to James' son-in-law and nephew the Prince of Orange to invade England by force. On September 28, James published a proclamation against the forthcoming invasion. The Prince of Orange issued several declarations, September 30, October 10, and October 24, in each of which he stated his intention to restore the former state of religious oppression. On November 5, the Prince of Orange landed at Brixham with an army of 15,000. On December 11, James withdrew from London with the intention of retiring temporarily to France. This first effort was thwarted, but a second on December 23 was successful. A Convention of the Lords Spiritual and Temporal, and Commons, thereupon assembled at Westminster, and on February 13, 1689, published a declaration that James had abdicated the government. On April 11, 1689, a Convention of the Scottish Estates made a similar declaration. James retired to France where he lived at the Château of St. Germain-en-Laye. He continued to be recognised as king by Louis XIV of France until the Treaty of Ryswick in 1697; on June 8, 1697, James published a protest against this treaty. James died September 16, 1701, at the Château of St. Germain-en-Laye, when he was succeeded in all his British rights by his son James. His body was lain (in a coffin, but not buried) in the Chapel of Saint Edmund in the Church of the English Benedictines in the Rue St. Jacques, Paris. His brain was sent to the Scots College in Paris, his heart to the Convent of the Visitandine Nuns at Chaillot, and his bowels divided between the English Church of St. Omer and the parish church of St. Germain-en-Laye. James' body remained in the Church of the English Benedictines, waiting translation to Westminster Abbey, until the French Revolution when it were desecrated by the mob and lost. Lost also during the Revolution were his remains at the Scots College, the Visitandine Convent of Chaillot, and the English Church of St. Omer. The praecordia which had been placed in the parish church of St. Germain-en-Laye, however, were rediscovered in 1824 and remain there to this day. The Life of James II. Edited by James Stanier Clarke. London, 1816. The manuscript of this work is among the Stuart Papers at Windsor Castle. It was compiled after James' death by one or more of his secretaries based upon James' own memoirs. In 1816 it was published by the Reverend James Stanier Clarke, Librarian to the Hereditary Prince of Hannover (later the Elector Georg IV). It is of first importance as a primary source, but is without any critical analysis. It is most reliable for the years before 1660 and for the years 1678 to 1685. Turner, Francis C. James II. London: Eyre and Spottiswoode, 1948. The longest and fullest of the modern biographies. Many bibliographic references to both printed and manuscript sources. Miller, John. James II: A Study in Kingship. Hove, East Sussex: Wayland, 1977. The best-researched biography. A favourable work which presents James as forceful, but not tyrannical. Trevor, Meriol. The Shadow of a Crown: The Life Story of James II of England and VII of Scotland. London: Constable, 1988. A generally favourable work by a professional biographer. There are numerous other modern biographical works including ones by Maurice Ashley (the standard biography from a Whig perspective), Hilaire Belloc (a thoughtful appreciation of the man, but with numerous factual errors), Peter Earle, Allan Fea, Edwin Sharpe Grew, Jock Haswell (especially good for the early part of James' life including his naval career), Malcolm V. Hay (showing the errors of Winston Churchill's treatment of James), Florence Higham, and Ernesto Testa (polemically Whiggish and totally unscholarly). This page is maintained by Noel S. McFerran (noel.mcferran@rogers.com) and was last updated June 5, 2007. © Noel S. McFerran 1997-2007.